If you are still on a version of IBM Cognos TM1, it is time to plan your upgrade to its rebranded successor, IBM Planning Analytics. If you are on an older version, IBM support has already ended. There has been a lot of buzz around IBM Planning Analytics, particularly around its two new components: Planning Analytics Workspace (“PAW”) and the new Planning Analytics for Excel (“PAx”) add-in. While PAW and PAx provide a compelling reason to upgrade (as documented in this QueBIT blog post), our advice is to start with a smaller, simpler step: get onto a supported version of TM1, and keep everything else the same. We call this the Minimal Upgrade. “On-Premises TM1” refers to the type of software license you own, and the location of your TM1 Server. If the location is your company’s data center, under your desk, or in fact anywhere OTHER than the IBM Softlayer Cloud, then you have an on-premises license. On-Premises Planning Analytics is called “IBM Planning Analytics Local”, or PA Local for short. In other words: If you are staying on-premise, there is no immediate requirement to deploy the new components, Planning Analytics Workspace (PAW) and Planning Analytics for Excel (PAx). You can continue to use TM1 Web and Perspectives or Architect, which are fundamentally unchanged. PAW and PAx can be added in a later phase, giving you time to explore new options and opportunities with the technology, and to plan end user enablement and training (which will be necessary). 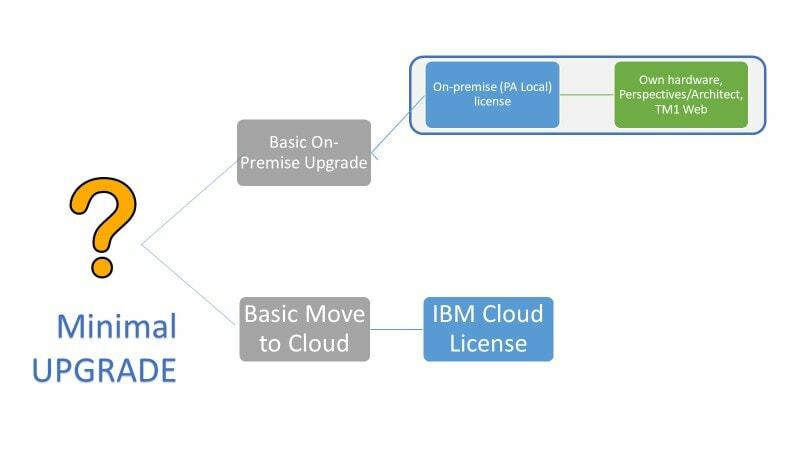 If you go the IBM Cloud route, you will need to make plans to roll out PAx to any end users who need Excel access to TM1, and you should expect that your software license costs will change (take a look at the Current Offers below). Our next blog post in this series will summarize what you need to know about the Planning Analytics technical system architecture, so you can be fully informed as you plan your upgrade. Contact us NOW at upgrade@quebit.com to find out more about these offers! QueBIT has PA Upgrade services and training offers. Click here for more information or email upgrade@quebit.com. 5 Reasons you should Upgrade to PA Now!